I was so looking forward to an event scheduled to happen in Faithlegg graveyard this morning. However, like so many other plans across the nation it has fallen victim to the weather. The weather I'm referring to, for anyone living abroad, is a snowstorm which struck on Tuesday and has persisted all week. The event was the blessing of the bonnets at the Meagher family tomb. The bonnets project is the brainchild of Dr. Christina Henri an Australian artist who has worked to raise awareness about the 25,000+ women who were transported to Australia, sometimes for offences as minor as stealing bread to feed their children. I blogged about her project last year, to help promote the exhibition created by local crafts women as part of International Women's Day and hosted by the Waterford Women's Centre. 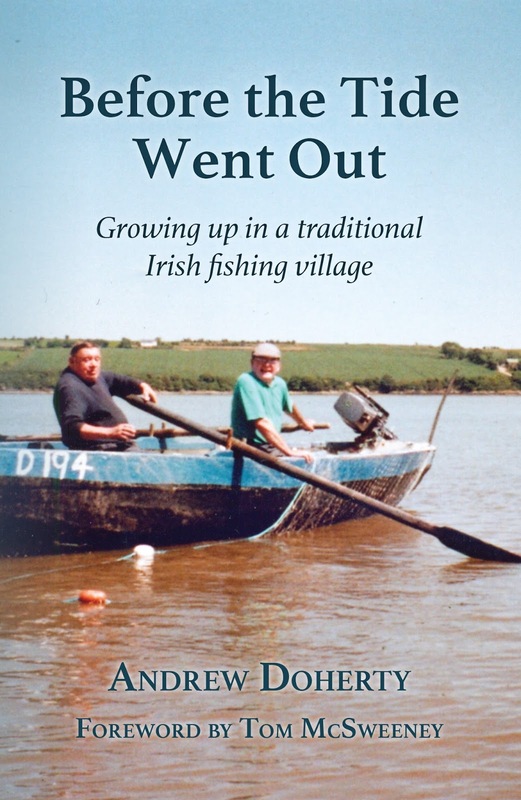 Its happening again this year in Central Library, Waterford. I was excited at the prospect of this mornings event of course because it would have brought more national and international attention the tomb of the Thomas Francis Meagher family here in Faithlegg and provide a higher profile for his first wife, Catherine. Catherine Meagher was the daughter of an Irish free settler to Tasmania, Australia named Bennett. 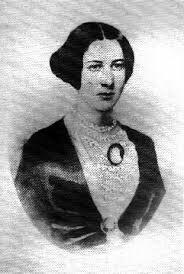 She was only 19 when she met and fell in love with the Irish freedom fighter.# Thomas was originally sentenced to death following the failed Young Irelander rebellion of 1848, but his sentence was reduced to transportation to Australia by Queen Victoria. Catherine was a governess when they met and Meagher later wrote that her influence was his salvation. They married on February 22nd 1851 and a year later her first son was born, Henry Emmett Fitzgerald Meagher.## However by this stage her husband had staged a dramatic escape from his sentence, firstly with the help of local fishermen to the island of Waterhouse Island, where ten days later he was picked up by the ship Elizabeth Thompson which dropped him to Pernambuco and eventually via the American brig Acorn to New York arriving Nay 26th 1852*. The plan was that his wife and new child would join him there, but their son died and following his funeral and a period of mourning she commenced the journey alone. She journeyed to America with her father in law, but the reunion with her husband was an unhappy one. He was seen as a hero in America and his energy and time was devoted to his adopted homeland and he was constantly in demand. 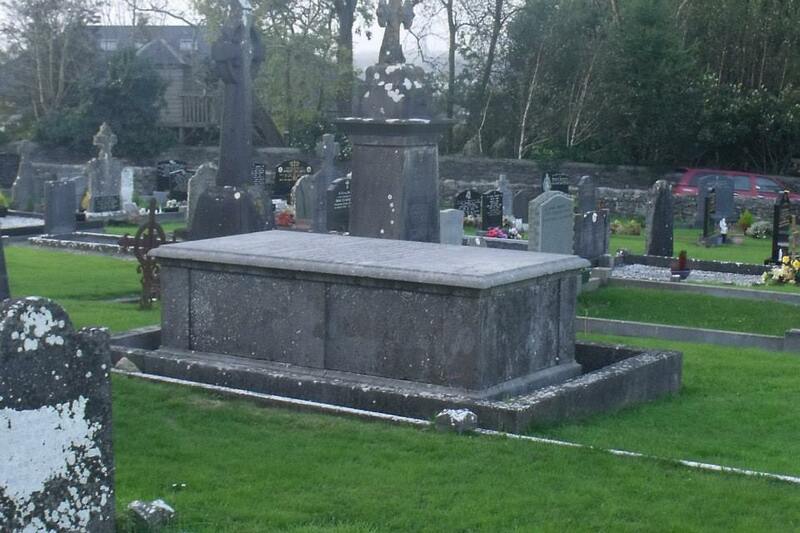 When Meagher decided to journey to the west coast, Catherine, who was pregnant at the time opted to return to Waterford but following the birth of another son, she fell ill. She died in the Meagher home at midnight on Monday 9th May 1854 aged 22. She had been sick for a fortnight with Typhus. Her hope was that she would return to America to be with her husband. However she was buried in the family tomb at Faithlegg. I have written before how that was a right denied her husband. So unfortunately today instead of a blessing and some welcome attention on this forgotten lady, we are ensconced in our homes awaiting a thaw. The events of this years 1848 committee are in tatters despite all the committees hard work. As a member of many groups I realise that perhaps 90% of the work was already done. So as disappointed as I feel over the loss of this event they must feel so much more frustrated. But there is always next year for the committee, and don't forget the bonnets and the other events coming up soon for the local International women's day. (1)Waterford News 8th July 1935 p2. The gifts (which were described as "having the advantage of being useful as well as beautiful") were of silver and gold and included a brooch, a bracelet and a card case. The presentation was made in the drawing room of Meaghers home on the Mall and was made by the Mayor, Thomas Fitzgerald Strange. *Cavanagh. 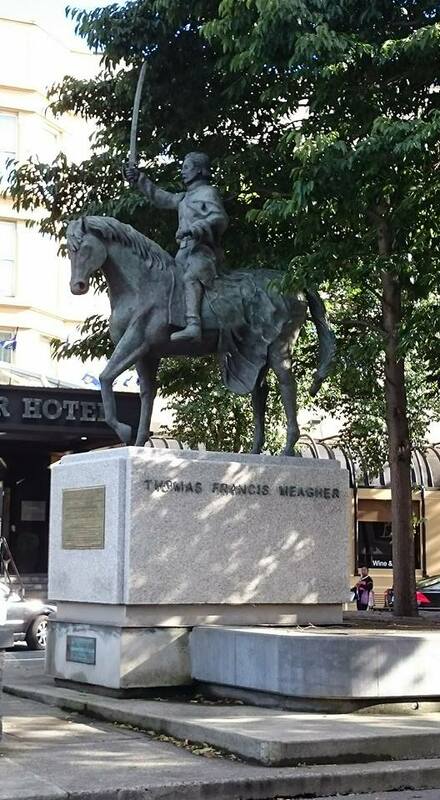 M. Memories of General Thomas Francis Meagher. 1892. The Messenger Press. Worcester. Mass.